Normally in Stock. Leaves the warehouse in 1-3 days. The Jacobs Ladder provides a complete workout in a fun, new way. Experience the most complete, low impact, high intensity workout possible. If you own a health or fitness focused business, give your customers and patients what they want – the best and most innovative fitness equipment! That starts with a Jacobs Ladder. Want to get in shape fast? There’s a reason why the Jacobs Ladder is used by the famous Biggest Looser fitness team. It works! Need a way to set your rehab center apart from the competition? Add a Jacobs Ladder and help your patients speed their way to increased strength, rage of motion and recovery. Unlike treadmills, the Jacobs Ladder offers an aerobic cardio workout but without the stress on the bones and joints experienced while running. Tired of spinning on stationary bikes for hours and just working part of your body? The Jacobs Ladder is the answer. It is the preferred training machine of professional athletes, pro football teams, the FBI, the Army, the Navy, West Point and Division 1 University sports teams. 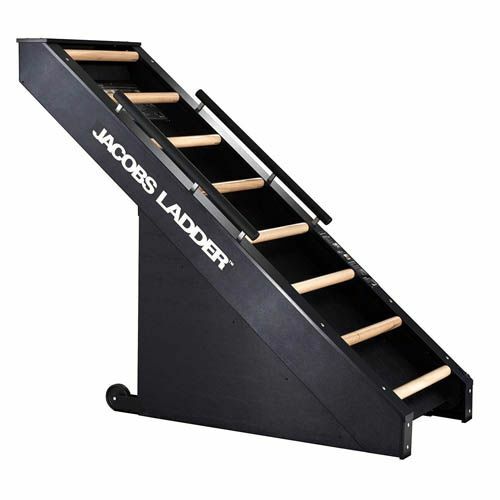 From the beginning, the Jacobs Ladder was engineered for fitness. The digital readout displays all the essential information needed to track progress and results. See instant feedback on calories burned, elevation climbed, elapsed time and rate of speed. Use the display to follow any number of exercise routines from rehab programs to law enforcement fitness training. Exercise and maintain a posture that eases the strain on the lower back, hips and knees. The natural climbing motion of the Jacobs Ladder and the machine’s design allows exercise while holding the spine at a 40º angle. The Jacobs Ladder was designed as the perfect exercise machine to rehab lower body and back injuries. The smooth climbing motion promotes natural and very low impact stress and articulation of upper and lower body extremities. No external electrical source is required to power the Jacobs Ladder. Placement of the machine is not limited by electrical requirements. The innovative design of the Jacobs ladder makes possible high intensity aerobic or anaerobic workouts that simulate the actual physical challenges faced by the military, fire fighters and policeman. Jacob's Ladder is a patented one-of-a-kind, commercial cardio machine specifically designed to help almost anyone achieve his or her fitness and health goals. Whether you’re a fitness enthusiast, athlete or health care professional a Jacobs Ladder is the fitness machine for you. Its unique design places the user at a 40° angle in order to take stress off of the lower back. Since the Jacobs Ladder is self-paced, the faster you go, the faster it goes. To stop just stop climbing and the machine stops, to slow down simply slow your pace. Unlike a treadmill with a pre-set speed, you don’t feel the unnatural, machine-driven motion. The Jacobs Ladder moves as you move, at your pace – whether that’s high-intensity or steady and low-paced. Also, because the Jacobs Ladder is also self-powered, there’s no need for an electrical outlet, you can place it anywhere in your facility. New app available for the Jacob's Ladder. Log your results and if you want, post them to Facebook or send them out in an email to someone else. What a great way to show progress! Jacob's Ladder treadmill climber is designed for fitness professionals, athletes, military, fire, police or anyone looking for aerobic endurance and anaerobic conditioning. Jacobs Ladder is not for people who don't want to get in tip top shape. Twenty Minutes on this machine will seem like 2 hours. This is not for babies.The Ladder is for GrownFolks.It will work your entire body from shoulders,triceps,biceps,Quads,Glutes,back,and calves. It is a beast of a machine and where I go I can use it most times without waiting because people don't want to work out that hard. It you want to get in shape this Machine is it.It is the best piece of equipment that any Gym could purchase because you get to most of the the least amout of time.